Books — Mary Jo Peterson, Inc. The demographic of an aging population, combined with a greater awareness of the needs of people with disabilities as well as recognition that all people have differing physical and mental abilities both in general and at different stages of their lives, has alerted the design community to the need for more accessible (barrier-free) living and working environments. Legislation such as the Fair Housing Act and the Americans with Disabilities Act, as well as standards developed by ANSI, UFAS, and individual states, have mandated certain minimum requirements. Nonetheless, little guidance is available on how to implement these standards. 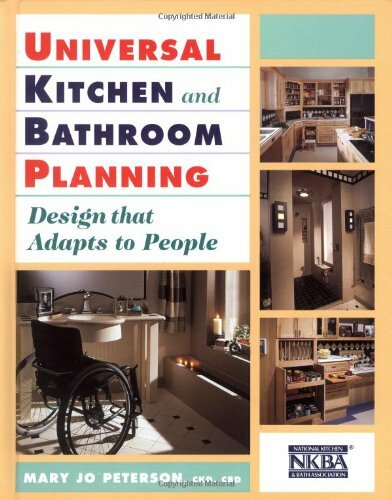 Putting universal-design principles into practice--in residential interiors--is the focus of this book, a companion volume to Accessible Housing by Design, covering both the interiors of new homes and of renovations and affordable and luxury alternatives. 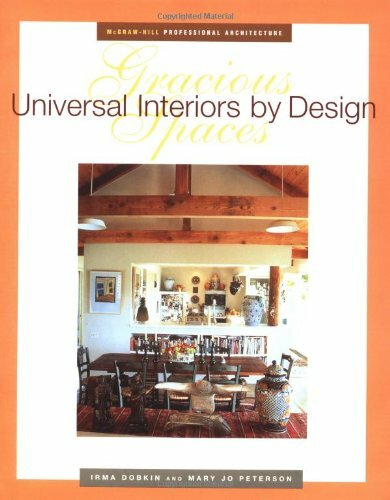 Peterson's many pages of illustrated guidelines should be helpful to kitchen and bathroom planners trying to incorporate universal principles in their designs. Everything from planning for the two-cook kitchen to providing adequate space for bathroom-fixture access is carefully laid out, and there are a number of hints and suggestions for making daily chores easier for people with a wide range of abilities. Balance, strength, coordination, safety, mobility, sight, perception and cognition are some of the traits that need to be kept in mind.